O'Reilly ETech Conference 2009 Call for Participation is now open. Submit your proposal by September 17, 2008 The 2009 O'Reilly Emerging Technology Conference will focus on exploring the emerging trends in the technologies that affect our everyday lives, including: * City Tech: Our cities are growing, getting bigger faster than ever before. People are rushing to them in search of economic and social opportunity-jobs, urban living, and access to culture. How can technology help us create livable, prosperous, sustainable cities? What should mass transit look like? How can we infuse urban infrastructure with sustainability? How are cities using citizens' data to become smarter? What can economics tell us about the way urban populations will change and behave? * Materials & Mechanics: Mechanics and materials develop hand-in-hand. The creation of a new, lighter metal enables iPhones and Mars Explorers. We'll examine the latest in mechanics and the materials that enable new developments. What mechanisms will be possible? How will the coming age of materials change our clothes, our products, and our everyday lives? Can they be made the cradle2cradle way or will we simply be clogging our landfills with ingenious, meticulously crafted waste? * Personalized Healthcare: Medical technology is something that almost everyone comes to rely on, whether it's hopeful, preventive care in the form of Reseveratol, or a new limb. In no other area does the industrialized world have more of an advantage. What legal framework for personal genomics balances innovation and appropriate medical caution? How is medicine changing? How is healthcare changing across the world? Many resources are focused on anti-aging technology and drugs-is this the right direction? * Mobile & The Web: The next billion people will come to the Web via connected mobile devices. Currently, many of these devices are humble dumb clients, but the iPhone, Google, and Nokia are bringing smarter clients to the masses with open platforms. How will these mini-computers change our lives? How will these jumbo-sized sensors benefit us? Will we be able to use the third screen to view an augmented world? What data will be collected and who will have access to it? Is the Web ready for the Next Billion? What will their web apps look like? * Geek Family: Digital native mothers and fathers are starting their own families. How is that changing home technology? Education technology? What does the future geek home look like and how does it function? * Synthetic Biology: We can't cover the reinvention of living without looking at the new definition of life. Synthetic biology, first pioneered in the 1970s, is becoming a factor in the development of new materials, medicines, environmental cleansing, and energy. How will this technology impact our lives? How can we be a part of it? What will bring it into the hands of the wider public? But ETech isn't just about "haves" and "have-nots." Some people choose to live with constraints within the abundant world. What trends and innovations are emerging? * Nomadism & Shedworking: As cities and their suburbs rapidly increase their footprint, there are some who reject the crowded living conditions, but take advantage of the connectedness. They adopt a high-tech lifestyle within the constraints of a smaller space or take their posessions and their bits with them on the road, to the farthest reaches of the globe. How do they do this and what can we learn from them? * Sustainable Life: The American lifestyle is unsustainable. How do we move to one-Earth economy? What are Europeans doing? Will Dubai be the trendsetter with its newest sustainable city? How will a renewed interest in environmental design affect us? Last year's keynoter Alex Steffen posited that it would be technology driving the change, not a restriction of habits or an energy diet. Right now the abundant world is being changed by rising oil and medical costs, forcing change. What technology will break through? * Life Hacking & Information Overload: We are bombarded with too much information, but at least some of it is relevant. What are the tools that we can use to process it? How can we identify the subset we actually care about? How do we identify the necessary bits of information that makes us more productive? Can we use cognitive science to help us deal with modern day living? What does neuroscience tell us about our brains and how we should handle learning and processing? Will ubicomp be able to help us stave off the overload or will it hasten our doom? 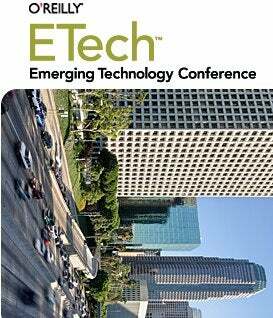 For more information, visit the Etech site.